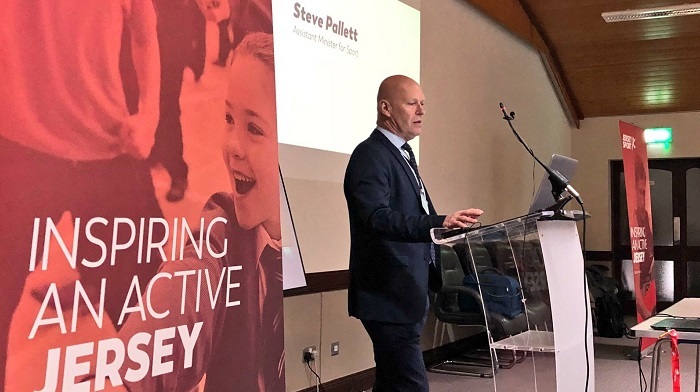 Nearly 40 people, including senior politicians, department leaders and a wide range of experts on sport and physical activity, braved the wintry conditions to be at the “Inspiring An Active Jersey” conference at St Paul’s Centre, St Helier. The conference is the most high-profile of consultation events ahead of the launch of a new government island-wide strategy being led by Jersey Sport. Elaine Wyllie, founder of the “Daily Mile” which encourages children in UK schools to run or jog for 15 minutes each day, was among the keynote speakers. She passionately outlined how academic results had improved at schools that had adopted the scheme, before conference delegates then took on the challenge themselves in the snow. Dr Charlie Foster from the University of Bristol and Michele McCoy from NHS Dumfries and Galloway were among the other guest speakers, with Nick Cavill, a specialist advisor to Public Health England’s obesity team, talking on the links between transport and physical activity, while independent consultant Jo Foster-Stead looked at how sport can build communities. Jersey Sport CEO Catriona McAllister gave an overview of her strategic plans, arguing that “we need bold change” and that “collaboration will be essential”. A series of further consultation events will be run to help shape the Inspiring An Active Jersey strategy, which will focus not just on sport but increasing the island-wide levels of physical activity. It is currently the intention of the Assistant Minister with responsibility for sport that the strategy will then be put forward for States approval and endorsement later in 2018.